This is the painting that I started yesterday. 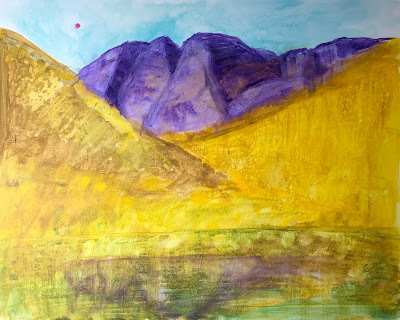 This is another mountain landscape based on my imagination and my memories of Colorado. Before I started painting today, I looked at more images of the Maroon Bells because I wanted to double-check those shapes. Well, no problem finding images! According to Wikipedia, the Maroon Bells are the most photographed mountains in the U.S. And I had to pick this to paint! Well, I had better get it right. So my morning's task was refining and reworking the shapes of the Maroon Bells. Although I will need to adjust the rest of the composition, I left that for tomorrow. To be continued. . . .